The main event kicked off with a strong showing from GM tgk59 who took an early lead... and then the inevitable happened when you lead - you have to play Magnus. Position 941 is notoriously tricky for black, and it showed! 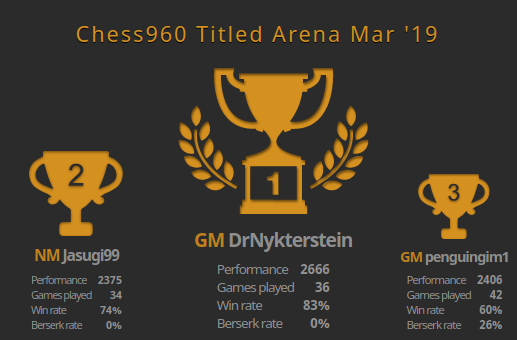 The reigning 960 TA champion (and world champion) ended up having to give his queen up for two knights to survive - check out the game below (it's worth it). It was GM tgk59's first loss, but they held on to the lead for a considerable time! One hour in, Magnus took the lead, with IM Saveliy Golubov (Boss1005) close on his heels. 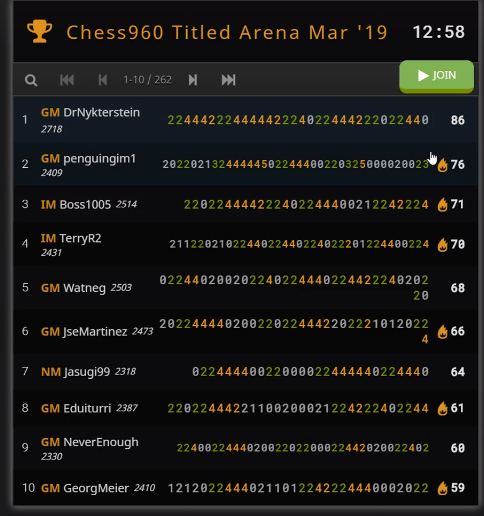 However, it was fan-favourite GM Andrew Tang (penguingim1) who was to wrench the lead away. Next a game from NM Janak Awatramani (Jasugi99) who was playing incognito at the time, showing that even those players who are "only" NM are still pretty decent at chess it turns out! Thank you as always to all the players, patrons, spectators and streamers who help to make the event both possible and so enjoyable for us all!